Think a salad won't keep you full? Our Meatless Monday Recipe will keep your stomach from growling between meals. This Grilled-Vegetable Salad with Lentils is packed with tasty vegetables, like vitamin K-rich asparagus, vitamin A-loaded zucchini, and and eggplant, which contains heart-healthy magnesium. Think a salad won't keep you full? Our Meatless Monday Recipe will keep your stomach from growling between meals. 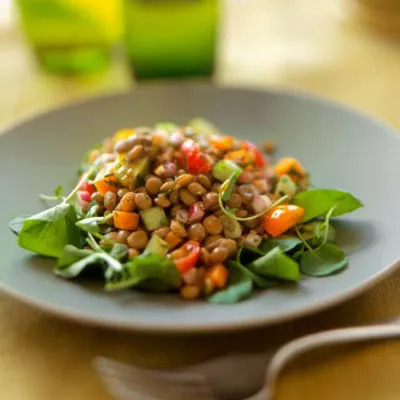 This Grilled-Vegetable Salad with Lentils is packed with tasty vegetables, like vitamin K-rich asparagus, vitamin A-loaded zucchini, and eggplant, which contains heart-healthy magnesium. Plus, there are three different kinds of bell peppers and red onion that add a little crunch and sweet flavor. The recipe provides 20 grams of fiber and 21 grams of protein, both known to keep you full.